I recently had the opportunity to take my imported Nissan Skyline GT-R to a Nissan dealership for service. It was the single most bizarre dealership experience I’ve ever had in my entire life, including the time I showed up at a Porsche dealer with tree branches embedded in my windshield. For those of you who aren’t quite sure why it might be strange to take a Nissan to a Nissan dealership, allow me to explain: My Nissan isn’t just any Nissan. The Skyline GT-R was never sold in America, and mine was imported from Japan just a few months ago, joining only a few hundred other Skylines that legally reside in the United States. And given that most Skylines are imported by the kind of guy who explains the term unsprung weight on Tinder dates, I’m guessing this is one of the only times in history a Nissan Skyline GT-R has ever entered an American Nissan dealership for service. You’d know all about my Skyline-to-dealer escapade if you followed me on Twitter, because I posted a couple of photos of my car hanging out with Altimas they’ll finance with nothing down, even if your credit report includes bankruptcy, divorce, repossession, animal cruelty, attempted murder, war crimes, etc. But until now, you wouldn’t know why it was such a bizarre experience. So today, I’ve decided to share that story with you from beginning to end. I made the decision to take my Skyline to a Nissan dealer a few months ago, when a reader asked me where I planned on getting the car serviced. 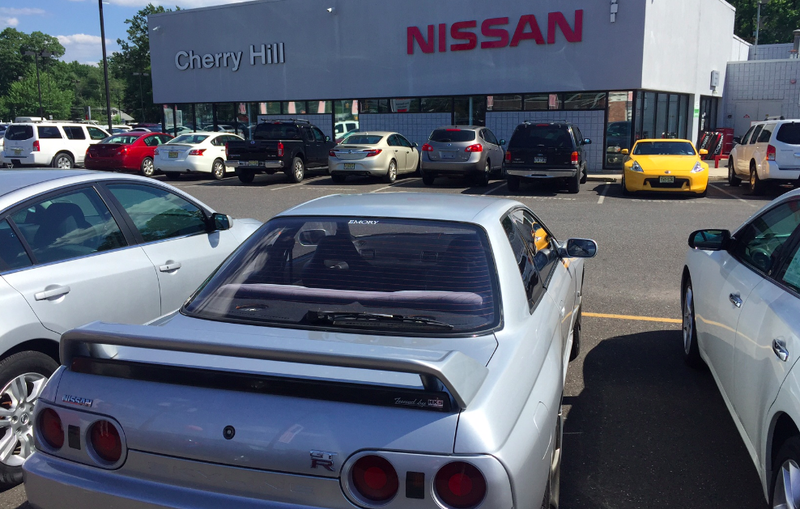 The answer is a well-regarded tuner shop in the Philadelphia suburbs, but the question got me thinking: What if I took my Skyline – my 25-year-old, right-hand-drive, freshly imported Skyline, with Japanese writing on half the parts visible under the hood – to the regular ol’ Nissan dealer, whose primary role is to tell people that the weird droning noise in their 2014 Altima’s CVT transmission is normal operation. The perfect opportunity presented itself a few weeks ago when a small plastic part came loose beneath the Skyline and began dragging on the ground. Just to be clear, this problem could’ve been fixed by anyone. A child. An infant. A koala bear with a Philips screwdriver. But I decided it would be the perfect test for the Nissan dealer, since it wouldn’t give them the opportunity to start playing around in the engine bay and potentially screw up something serious. So a few weeks ago, I called my local Nissan dealer, Cherry Hill Nissan (Motto: Buy a Rogue or we’ll shoot these puppies! ), and I told them I needed to bring in “my GT-R” for service. On the phone, I told them a little white lie: it’s a 2010 model, and not the 1990 GT-R that it actually is. If I had revealed that it was a 1990 GT-R, I reasoned, they would’ve been prepared for my right-hand drive weirdness, and the whole story would be blown. Unfortunately, this already created a complication: my dealer has only one technician who’s trained to work on the GT-R, and I’d have to make my appointment around his schedule. Knowing that I didn’t have the kind of GT-R they thought I had, and aware of how simple the problem was to fix, I protested, but the Cherry Hill Nissan Service Scheduler Lady was unrelenting: I would have to have the GT-R worked on by the GT-R technician, on the GT-R technician’s schedule. In retrospect, I should’ve told them I was coming in with a 1990 Maxima. So a few days later, I showed up at Cherry Hill Nissan (Motto: Now accepting exotic animals as partial trades!) for a service appointment with a Nissan Skyline GT-R. As I was driving there, I theorized there were only three real ways this could go. WAY ONE: The dealership would recognize me. Although this may sound a bit immodest, it’s exactly what happened last year when I took my Ferrari to CarMax for an appraisal. I figured at least the GT-R technician might know who I am, if not the service advisors – and if they knew me, the whole thing would be off, since they’d give me special treatment. WAY TWO: They get one look at the car and insist they won’t service it. I deemed this to be the most likely outcome, given that these people are probably designed to deal with elderly customers who backed over a wheelbarrow in a Maxima, and not some guy bringing in a right-hand drive sports car that predates Taylor Swift. WAY THREE: They freak out about the car, and get all excited, and everyone in the dealership insists on getting a picture in the driver’s seat, up to and including Jimbo, the night security guard, who is currently playing snooker in a South Jersey pool hall, but I just have to wait for him to get here, because this is his favorite car of all time. So I pulled up to the dealership, not knowing what to expect. I parked in a normal spot like a normal customer and walked through the normal door like a normal guy with a normal Nissan with a normal problem. And then I reached the service desk, where I was greeted by an advisor named Herb. Or maybe Tim. I don’t really remember. Now, at this point, I should let you know that I’ve made a video of my interaction with Herb-Tim, and it’s attached below. Unfortunately, privacy laws prevented me from actually filming my encounter inside the dealer, so I’ve instead filmed myself playing both the role of a) Herb-Tim, and b) me. You can easily distinguish which is which in the video, because I’m wearing helpful nametags. What happened next stunned me, because it didn’t fit into any of the three scenarios I described above. Basically, my Nissan service experience went like this: they literally could not have possibly cared less that I was showing up at the Nissan dealer with an imported Skyline GT-R. They didn’t say anything complimentary. They didn’t say anything about how they hadn’t seen one before. They didn’t say anything about the fact that it was right-hand drive. They just treated it like it was a regular old Nissan; just another Murano CrossCabriolet in to see if they could stop the top from flopping around like a salmon that just had its tail bitten off by a grizzly bear. After a few minutes, I got the feeling that I could’ve shown up in a Rose Bowl parade float, 80 feet long, replete with flowers and giant whimsical designs, taking up most of the parking lot, and Herb-Tim would’ve looked up from his coffee and asked: What’s the VIN? In fact, the vast majority of our conversation centered around the fact that Herb-Tim couldn’t understand why a 1990 vehicle didn’t have a 17-digit VIN number. He first asked for the registration, then the insurance card, each time insisting that I didn’t have the correct VIN printed on the documents. Eventually, he made me walk with him out to the car, where he didn’t utter a single word of surprise, or delight, or even interest upon finding out the car was an original, right-hand drive Skyline GT-R. He just asked me to show him where the VIN plate was, and I did, and then we walked back inside. After a few minutes, and to my utter amazement, he asked me to leave him the key, so they could take the car back and work on it. Consider it: I can’t drive this car two miles without dozens of people walking up, and pointing, and shouting, and asking questions at every traffic light, and here I am at the Nissan dealer and they haven’t uttered a single word of interest. As Herb-Tim struggled to enter the car details into his computer system, I kind of got the feeling that he thought this was just an older U.S. model he hadn’t heard of. That was it. That was the entire Skyline-to-dealer experience. I show up in an icon; a legend; the brand’s most unique, special, seminal car ever built; a car that has been in every automotive video game since the dawn of time; and the whole encounter ends with the words: The cashier will have your keys. I was a little disappointed, because I had been building up this interaction in my mind for days, eager to see how the dealer would handle it. But in the end, they didn’t react. The whole thing was like the movie Titanic, if the Titanic hadn’t hit an iceberg and instead Leonardo DiCaprio went back to Wisconsin and became a middle school teacher. Or at least, it was until I was on my way out, when I decided to snap a few photos of my Skyline at the dealer for this column. That’s when it finally happened: first one salesperson came outside. Then a porter. Then another salesperson. Then, finally, the car was mobbed with salespeople, even though it was the very last day of the month, asking questions, and taking pictures, and shooting video, and poring over every detail. Finally, the Skyline had found its people. So why didn’t the service department care? I present to you my theory: during the 30 minutes I was sitting in the waiting room, three different people walked in, told a service advisor their license plates had arrived, and asked for someone’s help putting them on. Think about this for a second. These people had their license plates shipped to their home. In the mail. And their first response was to drive to the dealership so they could ask someone to screw them in. This, ladies and gentlemen, is the kind of crap a Nissan service advisor has to deal with. And so, when my car came in, they may have realized its uniqueness, and its legendary credibility, and its freshly imported status. But they probably didn’t care. They just wanted to get me in and out, as soon as possible, so they could deal with the next annoying person with the next annoying problem. Yes, sir, that droning sound is normal for your CVT. Yes, sir, we’ll get the license plate screws.